Lauren and Ethan are the husband and wife duo who make up Thousand Faces Cosplay. 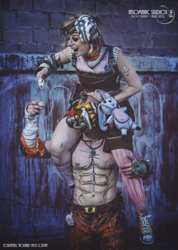 They are performers and bodybuilders and use theatrics and fitness to attempt to bring their beloved characters to life for you at the convention. TFC believes in portraying the characters they cosplay as much as possible, putting an even higher emphasis on the performance aspect than the costume sometimes. If this means learning a fictional language like Dothraki for Drogo or High Valyrian for Daenerys, learning an accent for Merida, Jon Snow, or Harley Quinn, shaving Ethan's head for Krieg, practicing new movement styles for Tiny Tina, or totally altering diet and workout plans in order to get shredded for Vega and Cammy, they do it.